Chicago Public Library discusses Ginger Pye. Eleanor Rosenfield was a children's librarian in New Haven, Connecticut. In 1931, she won the Caroline M. Hewins Scholarship, which allowed her to study at the Pratt Institute Library School in New York City. After graduation, she obtained a position with the New York Public Library. In 1932, she married fellow student Rice Estes, who later became a professor of library science. When illness kept her confined to bed, Eleanor Estes began writing. She wrote 19 children's books and one adult novel. Three of her books were chosen as Newbery Honor Books from 1954 to 1945. 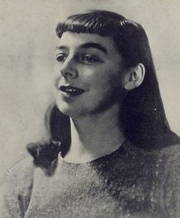 She won the Newbery Medal in 1952 for Ginger Pye. Her early books, particularly those about the Moffat family, published in the early 1940's, remain her most popular work. She based the Moffat books on her childhood: the town of Cranberry stands in for her hometown of West Haven, Janey represents Eleanor, and Rufus her little brother Teddy. Eleanor Estes is currently considered a "single author." If one or more works are by a distinct, homonymous authors, go ahead and split the author. Eleanor Estes is composed of 7 names. You can examine and separate out names.